The Old Vic set us a challenge: work with the the Community Company to create an interactive, digital experience that enables audiences to explore the themes of Rise in new ways. It was a process that lead us to re-look at a piece of technology we take for granted, and to use it to deliver an arresting dramatic experience in just a few minutes. To begin, we invited members of the Community Company, along with theatremakers and digital specialists, to a day of exploration – a Digital Imagination Lab. Working from early versions of the script we discussed parts of the play that most excited us, and considered how different technologies could be used to create a theatrical experience for audiences. Over 30 ideas were generated on the day, but there was a key area where our conversations about the play and about technology overlapped: that of connection. Rise presents London as a great city of interconnectedness: a meeting place of people from many walks of life, and a city connected to the rest of the world in the water flowing through the Thames. But also it is a play in which connections are fraying, where characters struggle in their relationships to one-another, and in their attempts to build new bonds. We identified similar tensions in our own lives — the feeling of being part of a huge city, but at the same time often siloed into regular patterns, places and groups of people. And we considered how technology has the potential to both help and hinder our connections. A smartphone, for instance, opens up the world to us from the palm of our hands, but in doing so, can disengage us from the here-and-now. Responding to this, our team considered how we could use a digital experience to create empathy for fellow Londoners. We wondered if we could use the telephone, a piece of technology that we have a complicated relationship with, as a way of delivering it. The final idea is called London Calling. You can experience this online and youll discover it installed outside the pop-up theatre. Weve engineered three special phone booths that, at any point during the run of the play, you may hear ringing. 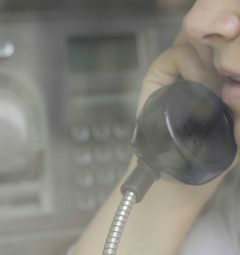 Answer the phone: youll find yourself listening to an answerphone message from one Londoner to another Londoner. The messages are sometimes funny, sometimes sad, sometimes profound. There are message of unrequited love, messages of delight, messages of accusation. The voices come from the Community Company, and there are dozens you might hear. Theyve all been left anonymously, but each caller was asked to direct their message to a real person they know. Just like the characters in Rise, we all have things in our lives left unsaid, and the participants in this project often reported a sense of catharsis or closure by leaving a message, even if it is never heard by its intended recipient. For someone hearing a call, the result is a tiny piece of drama in its own right. In a 90-second message, you hear a story played out, your brain rushing to fill in the missing pieces, to imagine the people involved. You have the opportunity to be pulled into the worlds of many Londoners, to catch a piece of their lives, to perhaps find a connection of your own with what they are saying. You can experience London Calling between 9-21 August, 10am until 9.15pm at Waterloo Millennium Green, opposite the theatre, and in the Penny cafe. You can also sign-up to hear the messages on your own phone for free here. This project has been developed with the generous support of Bloomberg Philanthropies, who share The Old Vic’s belief in engaging the community through the transformative power of theatre. 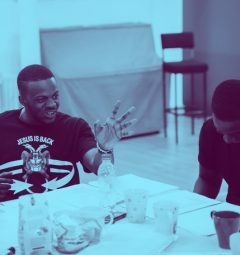 Through this collaborative partnership The Old Vic Community Company has drawn on Bloomberg Philanthropies expertise in digital technologies in the arts, environmental sustainability and education. This support has been invaluable to the scale and creative ambition of this project, which underscores The Old Vic’s vision to make exceptional, accessible theatre. London Calling was created by Flying Object, collaborating with Reduced Listening (audio), Marmelo (technical development) and Mill & Jones (phone-booth design / build).